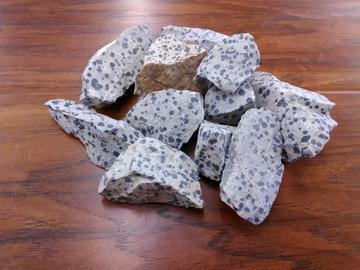 Dalmatian Stone, also called Dalmatian Jasper, is pale gray, cream or beige-brown stone made of feldspar and quartz. with black or brown spots of iron oxide, tourmaline, or other mineral inclusions that resemble the coat of a Dalmatian breed of dog. Known for its protective and healing properties, this mineral's vibrational energy is slow, though quite effective, and should be used long term. Great for tumbling and cabbing. Stones range from 1" - 2 1/2"